London and San Francisco-based enterprise collaboration service Huddle has raised Series D funding of $51m backed by Zouk Capital and Hermes GPE’s Environmental Innovation Fund, alongside existing investors. Started in 2006 by British entrepreneurs and 2009 Growing Business Young Guns Alastair Mitchell and Andy McLoughlin, the company with international additional offices in New York and Washington D.C. said the capital will enable it to continue expansion into the US and Europe. Specifically, 170-strong Huddle said it would double the size of its London-based product team, adding 80 new faces, to further develop its secure external collaboration technology while pursuing sales growth in “a small number of markets and verticals”, McLoughlin told Growing Business. In the first three quarters of 2014 Huddle – which topped the Startups 100 list in 2010 – won seven of its 10 biggest contracts to date and has a client list that includes Grant Thornton, P&G, Unilever, and Panasonic Europe, as well as extensive use by the US and UK governments. It already works with 80% of central UK government departments and the same proportion of Fortune 500 companies, NASA, the Office of the Secretary of Defense, the NHS, and four US federal agencies. Users are able to securely share, discuss and work on files in the cloud. The deal takes the company’s total venture capital funding to $89.2m. 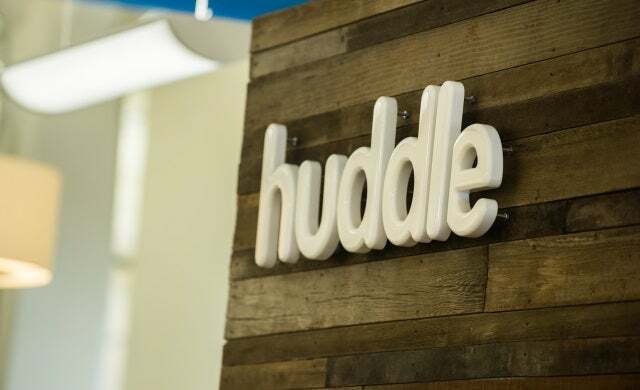 Huddle previously raised $24m in May 2012 with backing from additional investment from early backers Eden Ventures and Matrix Partners as well as In-Q-Tel, DAG Ventures, and Jafco Ventures. This followed a Series B round of $10.2m in May 2010 and a $4m A round backed by Eden Ventures in November 2007. He pointed to its “strong client-base of enterprise and government organisations” as well as the “impressive growth” and added that Huddle “meets Zouk’s resource efficiency investment thesis”. Through connected resources, processes and systems more can be achieved through “intelligent collaboration tools”, Salty said. Speaking exclusively to Growing Business Andy McLoughlin said the process, while never easy, had been smooth with Zouk from the outset. “When we decided earlier in the year that we’d raise the Series D acceleration round we spoke to a mix of US and European investors,” he said. On announcement of the deal, Huddle CEO Alastair Mitchell said the content collaboration market has “come of age over the last year, with enterprises and governments now replacing legacy software at scale and embracing this new way of working”. Cloud storage, where content gets “lost and siloed on shared drives” is being outmoded within larger enterprises where teams are seeking extract value from the content by working “within and across the firewall”.